A struggling outsourcer with a call centre in Guragong Connexions take calls for their one and only client the U.S firm Western Computer and Appliances. Call flow is however dwindling and the future of the firm is in question. Young and idealistic the college educated Vroom was originally working as a journalist, but took a job in the call centre due to the better money on offer. This choice is a constant source of tension for Vroom, who finds call centre work hard and though he tries to justify his choice by pointing out that with economic wealth comes greater power he also reflects on the hollowness of consumer society and the relatively low wages of Indian call centre workers compared to workers in the West. 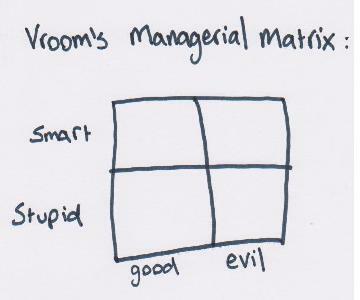 There are four kind of bosses in this world, based on two dimensions: a) how smart or stupid they are and b) whether they are good or evil. Only with extreme good luck do you get a boss who is smart and a good human being. Routinely abused by rude, angry and above all stupid customers. Vroom’s worst moment comes when he receives racial abuse from a drunk caller leaving him visibly distressed, trembling and breathing heavily. The tragedy of wasted talent. With his education Vroom could be a journalist making a difference in society, but instead he’s wasting this potential in the call centre. Vroom is also representative of the tensions of the outsourcing model where power lies with the big Western companies who profit by paying comparatively lower wages and with the Western consumers who act in an abusive way towards the virtually powerless call centre workers. I know it’s not your fault, but…. Like many people I’m no fan of bankers right now, but I can’t help but feel sorry for Natwest, or rather the people who have to work in their call centres. These are the people who are on an annual salary a city banker wouldn’t blink about blowing in a weekend, yet they are the people who must deal with the anger, panic, the hate, and the fury directed at the bank over issues they have had no part in, or any control over. If you call Natwest please go easy on whoever answers the phone – It’s not their fault. Happy Christmas everyone. Hopefully you’ve got all your presents and are not waiting anxiously on an order today; or even worse is hanging on the telephone in queue position 16 in an attempt to find out what’s going on. Hopefully too you’re not one of the people taking those calls. If you are then I hope you’ve got a bottle of wine and an understanding friend or partner waiting at the end of your shift. Thankfully this year I’ve also got all of my presents courtesy of Royal Mail who I think are unfairly vilified. As someone who has dealt with Yodel (formerly DHL) many times. I can say that Royal Mail are hugely preferable and it would be a shame were they to be broken up, or sold off. Also I’m not in the call-centre this Christmas. It’s a long story and I will bring it all up-to-date. I didn’t have a great day today. It started badly when I turned off my alarm causing me to oversleep. I then cycled hard to get in with just enough time to make a cup of coffee and land in my seat right on my start time. As our instructions are to begin taking calls at our start time at all costs my first action was to put myself ‘in group’ and start taking calls. Still flustered from the rush I got my log-in details mixed up. One more wrong move and I’d be locked out one of my main systems. I’d then have to trudge up to my managers desk and admit to my stupidity which is never a great way to start the day. Whatsmore the last time I got locked out of the system (through no fault of my own that time – someone else had been using my log-on for ‘training’) it took a period of weeks for someone in head-office on the continent to be bothered to reset my log-in. I tried to avert this crisis by trying to scribble my password on a bit of paper, like spelling a word sometimes it just flows that way, and third time lucky. I was in, but my equilibrium was now irreparably out-of-kilter. This is never a good position to be in. Like a ship navigating choppy waters in this job you need to meet the waves at the right angle else you’ll find yourself buffeted, tossed, turned, and dangerously out of control. I could sense my slightly testy mood causing some friction as the first waves of calls came in, but I was still in control. Just. Unfortunately I then got hit by an unexpected wave. It began as a routine order. Just one of the hundreds I get through without incident each shift. ‘Can you read the card number back to me after I’ve given it to you?’ asked the customer. It’s a question we get asked every so often by some of our more anxious customers, but it’s generally totally unnecessary as even the most basic of systems will tell you if a number doesn’t add up. But in this case it was even more unnecessary as it was a live system which means that straight after typing in the number I hit the ‘pay now’ button and via the miracle of modern card payment technology the persons cardholder would be contacted for authorisation and payment would go through in 1.5 seconds or so. I explained this to the customer saying that as it was such a live system it really wouldn’t be necessary. It would far be easier and more secure for me to just type the number and click the button. if the number was wrong the transaction wouldn’t go through…..
I’m sure the text-book says something along the lines of ‘just humour the customer’ i.e Just read the number back and they’ll be happy and no more problem. The problem is the text-book doesn’t deal with moods and I wasn’t in a great one. I decided to dig in. “Well If I click pay and two seconds later it says ok, then I can assure you it will be ok. It all seemed too logical to me. I also find that if you do read the number back the customer will mis-hear a number like and loudly shout “NO, NO” at some point, then you go through it again and so on…. easier to press the button and trust in the tech. Plus in my more testy moments I resent the thought that I’m incapable of being trusted to take down a number it’s what I do all day everyday after all. It had approached an irreparable point. Fancy a call-centre job in a nice sunny location? According to the Guardian the Foreign and Commonwealth Office have created one in Malaga and from the sounds of it you’ll be in for plenty of laughs courtesy of some poor deluded souls….. The government had to set up a special call centre in Malaga, Spain, to filter inquiries. Recent ones included a request for Phil Collins’s telephone number and someone wanting to know the heir to the throne’s shoe size so she could send him a pair as a present. A caller in Malaga wanted to know in September where she could get Christmas lunch because everywhere she had rung so far was already full. As funny as these things are the thing is I can well imagine that dealing with these calls isn’t always a pleasant experience as the callers are deadly serious and can become angry when you can’t actually help…. ‘but, I’m a customer’ I hear them cry…..therefore you should be making all my dreams come true… Isn’t that how customer service works? I remember half chuckling and half wincing on hearing someones teenage sister had called ITV to complain about a contestant they liked being voted off the X-factor…I couldn’t help but feel sympathy for the poor person in the call-centre being paid to take a verbal battering from waves of disappointed teen-girls all with an overdeveloped sense of entitlement.